A bricklayer by trade, Neal Mehrenberg laments the dissolution of the Allentown church building that served as his family’s spiritual home for four generations. St. George Church, completed in 1912 to serve an ethnic German congregation, was the center of his grandparents’ and parents’ community, hosting several crowded Masses each week. 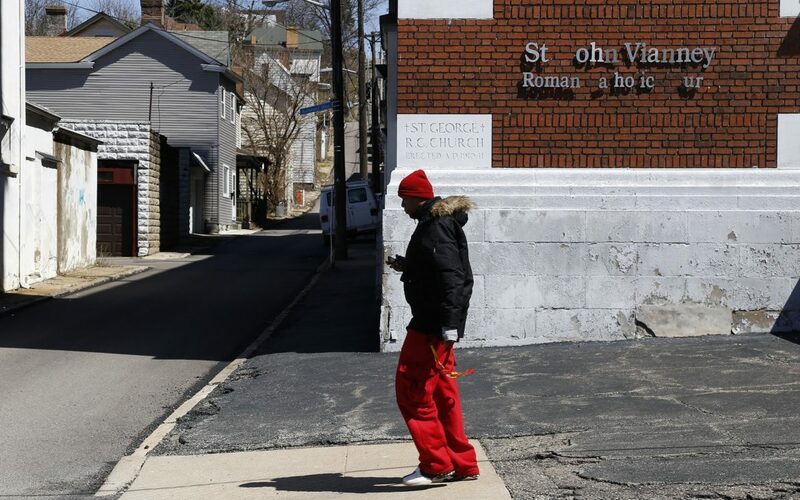 But by the time Mehrenberg married at the Climax Street church in 2010 and then had his son baptized, the diocese had closed three other parishes and folded them into his, renaming the parish St. John Vianney. Those parishes’ churches, schools and other buildings were sold off or torn down. In January 2016, the diocese announced that St. John Vianney parish would be dissolved due to dwindling attendance and $3 million of debt. Parishioners were scattered to three other Hilltop parishes. Bishop David Zubik also decreed that the St. John Vianney church building be relegated from “sacred” to “profane” use. Under canon law, the windows and sacred objects should be removed when a structure is designated for “profane” use. The edifice can be repurposed or torn down. The parish did close, holding its final Mass in April 2016. St. Mary of the Mount in Mt. Washington took ownership of the church building. Meanwhile, the debt was forgiven, absorbed by the diocese. In September 2016, the society received news that it had won its appeal, thereby revoking the diocese’s decree to change the church building’s status. A few months later, parishioners met with diocesan leaders hoping to negotiate an arrangement to reopen the church. Zubik, however, said the appeal won on a procedural technicality. The pastor of St. Mary of the Mount, the Rev. Michael Stumpf, consulted with his own parish pastoral council and financial council, who were in support of closing St. John Vianney. So Stumpf recommended, and the bishop again decreed, that the building be closed. The society appealed that decree in August 2017. Zubik said the society’s efforts aren’t based upon a sustainable vision for the future. “They’re living out of nostalgia. Nobody is going to argue that St. John Vianney isn’t a beautiful building, but it takes more than a few bucks to keep that going. 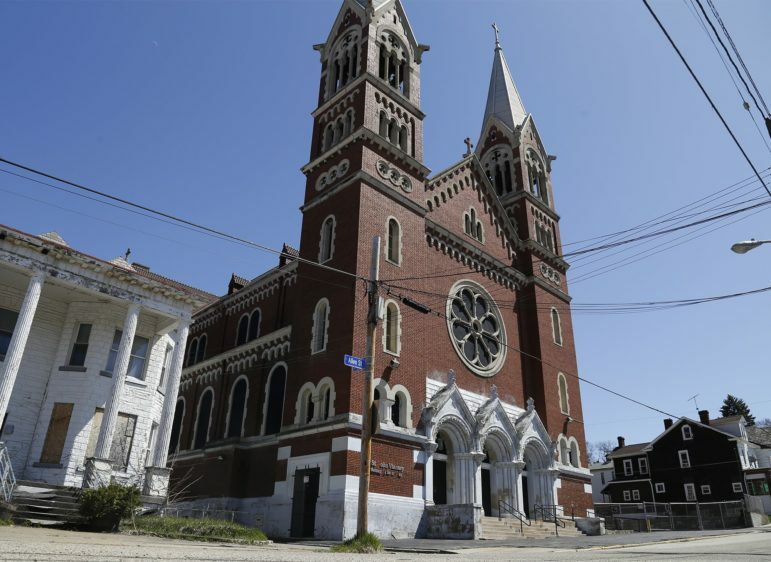 St. George Church (now called St. John Vianney) is a casualty of trends affecting the entire six-county Catholic Diocese of Pittsburgh. 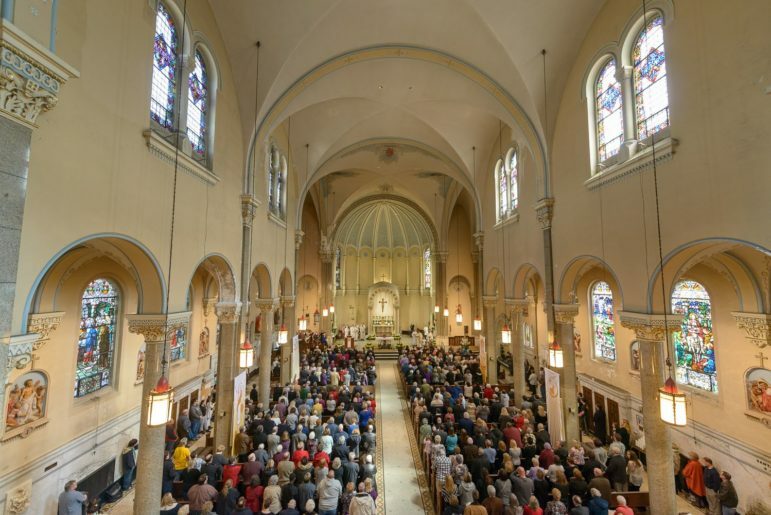 Though the diocese includes more than 600,000 Roman Catholics, only about 150,000 people attend Mass on a given week, a 40 percent decrease since 2000. Additionally, the diocese faces a shortage of priests and half of the parishes run operating deficits. To address the decline, the diocese launched the “On Mission for the Church Alive!” strategic planning process in 2015. In September 2017, the On Mission Commission made recommendations to reduce the number of parishes from 188 to 48. Final decisions will be announced April 26, after which each new parish will undertake a multiyear analysis to determine which buildings they should maintain or close*. Sticking points between the diocese and the society on the Allentown church building include needed repairs, which the diocese estimates would cost $1.1 million. The society produced a plan to reduce that figure to about $600,000 through value engineering, choosing different contractors and prioritizing repairs or even forgoing those that aren’t critical, like padding on pews. Kress said that with support from the “St. 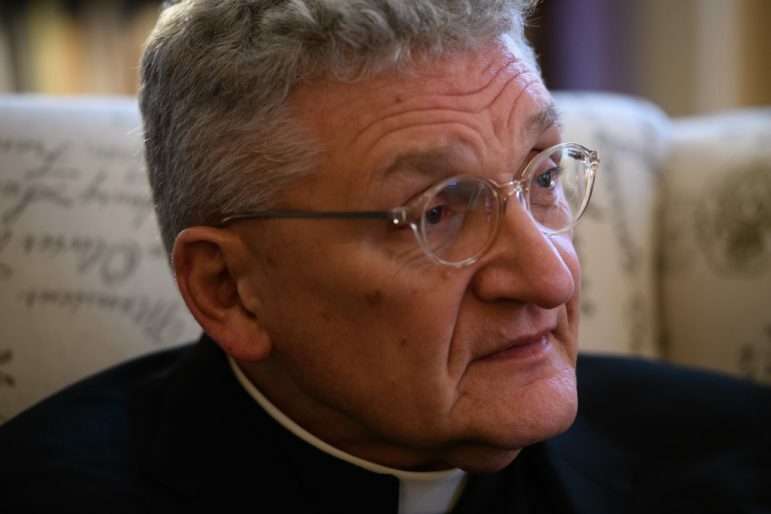 George family” — former parishioners, parish school alumni and others, including those now living outside of Allentown and even Pittsburgh — the society has raised $150,000 in cash and pledges toward repairs, and the society’s contact list has grown to 1,300 people. "Nobody is going to argue that St. John Vianney isn’t a beautiful building, but it takes more than a few bucks to keep that going." Earlier this month, the society submitted a proposal to have the diocese deed the church to them. The way Kress sees it, whether through a sales agreement or a triple-net lease (in which the nonprofit would take on all operating, insurance and maintenance costs), the diocese has nothing to lose. Society members are waiting on the Vatican’s decision on its second appeal. Aaron Sukenik, executive director of the Hilltop Alliance, wrote in an email that the building is significant for the community, too. Though Mehrenberg now lives in Whitehall, his mother still resides in his childhood home just a few blocks from the church. *Update (4/29/2018): The Catholic Diocese of Pittsburgh announced on Saturday, April 28, how its 188 parishes would be grouped into 57 new, multisite parishes. The diocese had originally proposed there would be 48 groupings. The diocese also shared which priests and deacons would be assigned to the new groupings. According to the diocese press release, the groupings are expected to merge into new parishes between 2020 and 2023. A complete listing of parish groupings, clergy assignments and other information is available at onmissionchurchalive.org. Sorry, I grew up in the merged parish. The committee that was supposed to decide which building would be saved rigged it to save St. George by stacking the board. They knew St. George was the poorest of the combined parishes and had the most derelict building. They needed a new million dollar roof but also needed another several hundred thousand in repairs to the walls. The building is basically decrepit. Sorry, your story is a full-on BS line and I get that your office is in Allentown but you guys weren’t around when these toolbags screwed St. Canice so they reap what they sow….